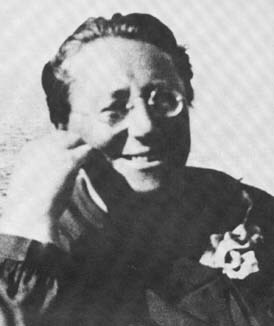 In honour of the great mathematician Emmy Noether the Faculty of Mathematics of the University of Göttingen has created a visiting professorship named after the scientist, who studied, taught und researched in Göttingen from 1915 until 1933. Once a year the faculty awards the Emmy Noether professorship to an outstandig female mathematician who will visit Göttingen for 3 to 4 weeks to present a current field of research in talks and seminars. 1. lecture: Tuesday, Oct 22, 2009, 17:15-18:15 h: "Indra's Pearls"
2. lecture: Monday, Oct 26, 2009, 16:15-17:45 h: "Geometrically finite groups and circle packing limit sets"
3. lecture: Monday, Nov 02, 2009, 16:15-17:45 h: "Degenerate groups and space filling limit sets"
place: Sitzungszimmer of the Mathematical Institute, Bunsenstr. 3-5.